15-41. That’s the age range of India’s shooters participating in the 21st Commonwealth Games (CWG) that gets underway in Australia’s Gold Coast on Wednesday. Three teenagers—Anish Bhanwala (15), Manu Bhaker (16) and Mehuli Ghosh (17)—are making their CWG debut alongside veterans such as Gagan Narang (34), Manavjit Sandhu (41), Heena Sidhu (28) and Jitu Rai (31). India’s shooters, 15 men and 12 women, will once again be our best medal hopes. The expectations aren’t exaggerated: Last month, India topped the medals tally at the International Shooting Sports Federation (ISSF) World Cup in Mexico, which was a first. It’s been a memorable March for Bhaker, who won multiple gold medals in the senior and junior World Cups. But talk about the prospect of a podium finish at her maiden Commonwealth Games and chances are that she’d just smile or change the topic. “That’s all she gets asked about—medals, rankings and podium finishes. After some time she just feels uneasy,” says her father, Ramkishan Bhaker. It’s amid the silence on the shooting range that the youngster feels at ease. As do Ghosh, Bhanwala and Shahzar Rizvi—all products of a robust junior training programme of the National Rifle Association of India (NRAI). Among those will be former World No. 1 Heena Sidhu, who was beaten by Bhaker at last year’s national championships. 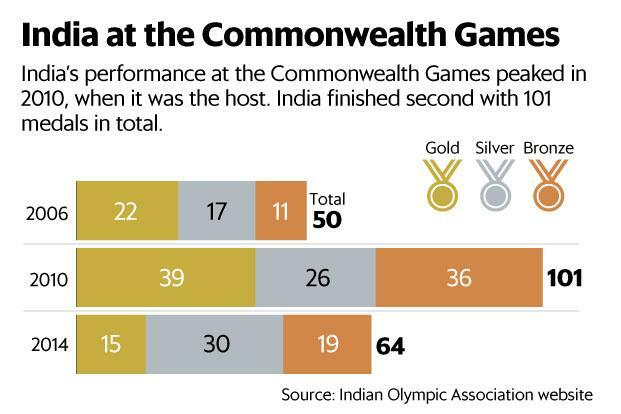 And even though the Commonwealth Games are perceived to be a grand, global affair, athletes such as Sidhu do acknowledge that it has a long way to go in terms of competition. “I see the Commonwealth Games as a build-up to bigger events like the World Championships (in August-September),” she says. Youth will be the key in several disciplines at the CWG, where the Indian contingent is 225-strong. Javelin thrower Neeraj Chopra and high jumper Tejaswin Shankar, both national record holders, will lead the charge in track and field. Weightlifter Mirabai Chanu, who won a World Championship gold last year, will hope to improve her silver medal-winning performance from Glasgow 2014. And gymnast Aruna Budda Reddy will be keen to show that her World Cup bronze in the women’s vault final wasn’t a flash in the pan. And then there are the seasoned campaigners who are looking for another twirl with glory: wrestler Sushil Kumar is eyeing a hat-trick of CWG golds, boxer M.C. Mary Kom is aiming for her first medal at the event, and badminton player Saina Nehwal, who missed the Glasgow Games due to injury, is looking to prove that she still has what it takes to win big titles.